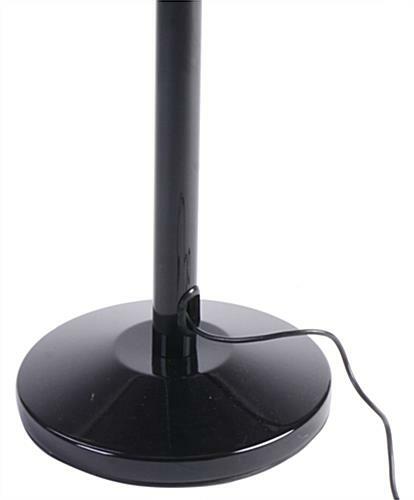 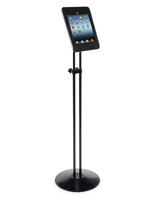 These iPad mini floor stands are 43" tall black steel interactive display fixtures with a locking mount and adjustable enclosure. Each sturdy fixture includes built in cable management as well as tilt, rotation and optional Home Button accessibility. 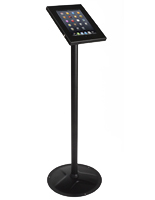 Commercial-grade Apple mini floor stands are ideal for establishments with limited counter space or businesses that need moveable enclosures. 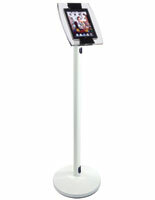 Unlike countertop or wall mount fixtures, these interactive displays are easily moved from place to place. 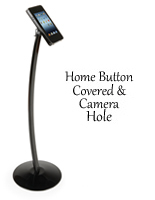 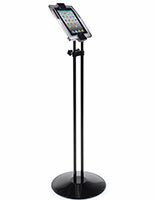 Mobile mini floor stands are ideal for use on busy sales floors, in restaurants, lobbies, offices and more. 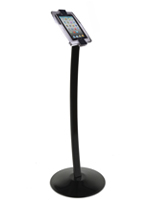 These black kiosks with adjustable enclosures and hoptional Home Button access make it easy for customers to access and interact with informational and marketing displays. 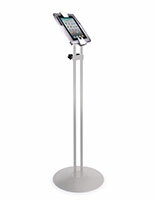 14.0" x 43.0" x 20.0"